Gadgets are fun, they're cool and they're interesting. I've found you gadget gift ideas for kids, teens and adults, men and women, boys and girls. See also my laptop and tablet pc recommendations and camera and camcorder reviews. Let's start with some of the gadget gifts that are most popular with my readers: You'll notice that they're not all that high-tech at all. Toysmith 3-D Mirascope A fun way to create 3D projections of real life objects, starting with the little frog that is included. The objects you put in, will look like they're floating on air. Users unanimously report that the frog is too big and that using a penny will work better. However, for the price, it's a fun buy. BACON shaped Bandages FUNNY- for bacon lovers that is... bandages that look like bacon. Gross your friends out! There are also other fun themes, like cupcakes! Perplexus Epic A 3D puzzle that looks good in the process. Perplexus Epic comes in several variations and will really make you scratch your head! Are you looking for the best gadget gifts to give to a friend or family member? Often we think of gadgets that our geeky friends will like but there are also cool gadgets and gizmos that can be given to just about anyone on our gift list. The gadget does not have to be a technology based item, it can be something that is useful and then again the gadget can be something that is humorous. Even though this is marked as a man's gift, I think women would like it, too. If the person on your gift list spends quite a bit of time commuting back and forth to work in their car, they often need change for parking meters or toll booths. Now, when they stop to grab a quick coffee in the drive through and get change back, they can place it in this gadget bank that actually tells them how much they have at any given time. I saw a Money Coach on television the other day that suggested that we not spend our change. To save it up for something special like a much wanted vacation or any extra item that we want the extra money for. The coach said that we would be amazed at how quickly all that change we get in a week will add up to a nice amount of money at the end of the year. This handy gadget can be used by anyone on your gift list. Does not matter if they are young or old, male or female; everyone has occasion to need something magnified. This little gizmo can fit in a pocket or be carried in a woman's purse. It is about the size of a credit card! 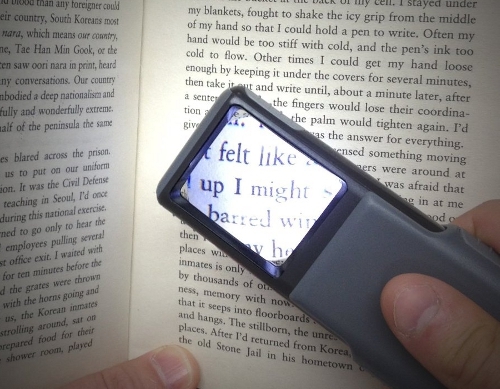 It magnifies up to 3 times and has an inset that will magnify up to 4.5 times. Also has a light incorporated into it. Two button cell batteries are included in your purchase. Are they always looking for their phone? Help them stay better organized by providing a place for them to keep their cell phone or smartphone when they lay it down. A pair of hands holds the phone on a desk top or table for always knowing where it is. No special batteries or electricity needed...just a handy little gadget that sits there to help. It's always a good idea to weigh your luggage and know how much it exactly weighs before leaving for a flight. Free Luggage weight allowed by nearly all Air Carriers has shrunk and they'll won't bat an eyelid before charging you extra. Choose from the best Best Luggage Scales around and don't let your air-travel bills bloat this Holiday Season. To be very honest - Office never really excited me. Always felt caged inside the four walls and the Politics and Backbiting really turned me off. Really happy to work from Home, but that still requires a desk - a home office. And I do think it makes it a bit more fun to have some office gadgets to cheer things up. I love the flower pen I got for my birthday a few years ago, for instance. I know not all of us feel the same way. Working in a regular 9 to 5 Job has its own advantages as well. Whether you work in a traditional Office or from Home - it's always possible to increase your Productivity and make the place more pleasant. Now all the supplies they need at there fingertips and on their desk can be organized in a fun and humorous way. Holds tape, pens, memo pads and paperclips where they can be easily accessed. How many times do we spill our Coffee, Soda, Water, and other Beverages on the Computer Keyboard and important Office Documents? Pretty regularly. No one wants a dead Keyboard or Tablet because of a silly mistake. The DrinKlip Cup Holder is a Cool extension for any office desk. It looks smart and saves a lot of trouble. Apart from drinks - it can also hold our Phone and other small items. Buy a couple for yourself and gift some to your Colleagues this year! Pen and Notebook are so last century. Digital Voice Recorders are the in-thing. Focus on the ideas expressed during Meeting and Conferences rather than taking Notes. DVR's are also a good idea to save ideas while you are driving. A must have Office Gadget for the 21st Century worker. Not having the time to workout is a usual excuse. We'd like to be fit and healthy but the busy work schedule leaves no time to Exercise. Treadmill Desk Station is the Coolest solution to combine Work and Play. It features extra long safety handles and supports up to 400 Pounds of Weight. Whether you are self-employed or are the Boss at a typical company - it is the perfect Health Gift for yourself and your Employees during the coming year! Solar Power is free - why not make use of it to charge your Smart Phone, Tablet, and other Mobile Devices? Opteka Solar Charger can also charge our Gadgets through USB Power. That's a great 1-2 Combo! No wonder it is the Best-Selling Solar Charger on Amazon right now. Be Green and responsible. Use Opteka Charger which includes 10 charging tips with USB Port to offer great flexibility in Compatibility. What a clever gift idea for that person on your list who seems to always be looking for his or her keys! Actually they can attach the device to just about anything that they lose often: keys, wallet, pets. One unit is attached to the item that gets lost while the other is used to find it. Finds items up to 60 feet away and will work through walls, cushions and more. A really cool gadget gift for your wine loving friends! Shaped like a bottle and small enough to be carried in a pocket or purse this little gizmo lets the wine enthusiast access around 10,000 reviews of wines and spirits. It also gives suggestions for which wine to have with specific foods. Also includes a glossary of wine terms. This gadget works for both males and females and almost seem like a gag gift but trips to the bathroom in the middle of the night can be a little easier with this handy gift. We wake up after a couple hours of sleep and we do not want to turn the lights on because it is too harsh on our eyes and it wakes us up a little too much. This gadget is motion sensitive: senses that we are approaching and turns a light on at the toilet seat. If it is glowing red, it means the seat is up...great for guys and even greater for gals to know. If the seat is down the light is green. And ladies if you have ever sat down on the toilet when the seat has been left up, you know you want one of these! 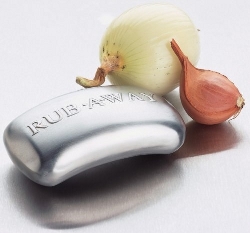 For the person on your gift list who loves to cook this is a handy little gadget. You know how when we start to prepare a dish and it calls for fresh garlic or onions and the smell just stays on our hands no matter how soon we wash them? 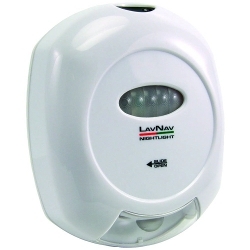 This little gadget removes the smell. Just rub your hands with the bar and the offensive odor is gone from our hands. It works with smelly fish odors, too. Probably the hottest trend in technology right now are the tablet devices made by Apple, Microsoft and other companies. The highly mobile and touch screen technology of the tablets are proving to be really popular with teens, students, men and women. So much lighter than carrying around a laptop for our computing needs and so versatile in their functionality! We can use them just about anywhere we go. We can keep in touch with emails and social media. We can read books and watch movies on them. We can search the internet and shop with them. Play games, if we want. Plus we can create documents, too. Many of the tablets offer a way to connect a small keyboard when there is a lot of typing needed and most are capable of having the keyboard connected to a carrying case for convenience. As you can see by some of the choices that I have listed, our Christmas gifts for gadget lovers do not have to be geared to just our geeky friends. There are gadgets that just about anyone would love to have and will be able to use them throughout the year. Gadget gifts often make wonderful stocking stuffer ideas and they are also a nifty idea to give to a fellow employee if the office exchanges gifts. Many gadget gifts are unisex in their nature and will be appreciated by either gender when they receive them as a gift. Are you looking for some fun Christmas gifts for gadget lovers? We all know someone who loves gadgets of some kind. Many times people equate gadgets being for our nerdy friends and they do love their gadgets. However, there are all sorts of gadgets that make great gifts for other people too. Cooks and chefs love gadgets for the kitchen. There are handy little gadgets for the men and women who love to tinker around with fixing things. People who love to read often enjoy the gadgets that are out there with them in mind. Gadget gifts can be on the funny side and almost considered a gag gift but others are actually very useful and make great gifts for just about anyone on your gift list. We live in such a technology driven society that most teens are not only familiar with all sorts of gadgets, they absolutely love them. In the not too distant past, teens might have been considered a little bit of a nerd or geek if they wanted electronic gadgets but that is no longer the case. Teens are no longer technologically challenged but are instead quite proficient in knowing how all of these electronic type gadgets work. I've included a few fun gadgets that aren't so expensive - 3D puzzles, a diversion safe and a hologram toy. The teen on your gift list might be asking for a new MP3 player, a tablet (small mobile computer) or a new gaming device. Gadgets that probably didn't exist when you were a teen. The teen might want a new version of a game system. Other options would be accessories that go along with the gadgets that they already use on a daily basis. So, let's look at some gift ideas that are great for a teen this year. If you are tired of giving and receiving the same old stuff every Birthday or Christmas, this collection of gadgets may help you come up with some new gift ideas. That way you can gift something unusual and truly unique this Christmas. Break the circle, don't be a follower anymore.